Boris FX Sapphire 2019 for Avid/Adobe/Autodesk/OFX features 200+ advanced and highly stylized effects, transitions, and looks and over 3000 presets for all aspects of your films and videos. Combining everything from the individual Sapphire 2019 Units, Sapphire 2019 provides large collections of Adjust, Blur and Sharpen, Distort, Lighting, Render, Stylize, and Transitions filters. Many of these are considered must-haves in the film, TV, and commercial production industries, with the Lighting effects perhaps the most widely relied on. This license includes a full, permanent version of Sapphire 2019 for Avid/Adobe/Autodesk/OFX and one year of upgrades and support. 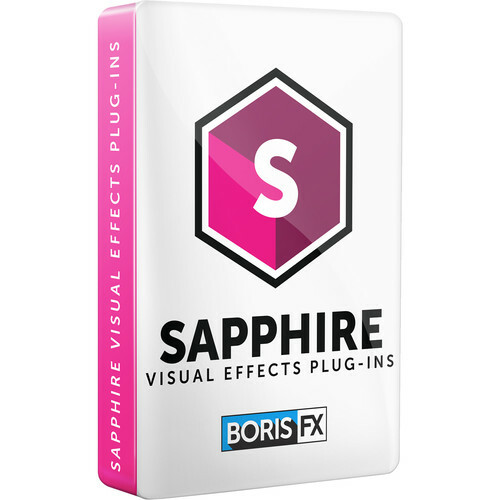 Sapphire 2019 for Avid/Adobe/Autodesk/OFX includes the sophisticated Sapphire Builder, which allows you to create and save your own complex custom effects using a simple workflow. The Builder is a node-based effect compositor where you can create from scratch, stack and connect other effects/transitions, and control every aspect of an effect using extensive parameter sets and numerous on-screen widgets. The Builder is filtered by common tasks, such as "color-correction" and "lighting," rather than by effect name, for much easier browsing. Creates an abstract texture by applying a EmbossShiny effect to a procedurally-generated noise texture. Simulates a traditional 2 or 3-mirror kaleidoscope.